Tom Behrends: fought for his Country, now he’s fighting for his home. Given the choice, no sentient being would ever tolerate an industrial wind turbine anywhere near their home or property. Merrily wrecking rural communities wherever it goes, the wind industry is facing real, red-blooded American resistance across the Midwest. In this piece from Minnesota’s The Globe, locals lament the day the wind industry rolled into town. The miserable (and totally avoidable) experiences of locals are not remarkable, but the attitude of the journalist, Julie Buntjer in recounting them, most certainly is. Not once does Julie use that condescending term ‘concerns’ – a biased little platitude employed by journos to diminish the credibility of what are simply stated facts; nor does she otherwise belittle or demean the subjects of her story. Nor does she allow the operator and it’s highly paid, lawyered-up goons to mock, ridicule or denigrate locals, in their customary fashion. For once, here’s a journalist simply telling it like it is. WORTHINGTON — When Tom Behrends purchased his farm east of Brewster in 1993, he envisioned peace and solitude on the prairie. Behrends was serving his country in Iraq when the turbines were permitted. He was told they were going up, but at the time he envisioned the towers would be placed in the middle of the section — not 1,100 feet from his home. 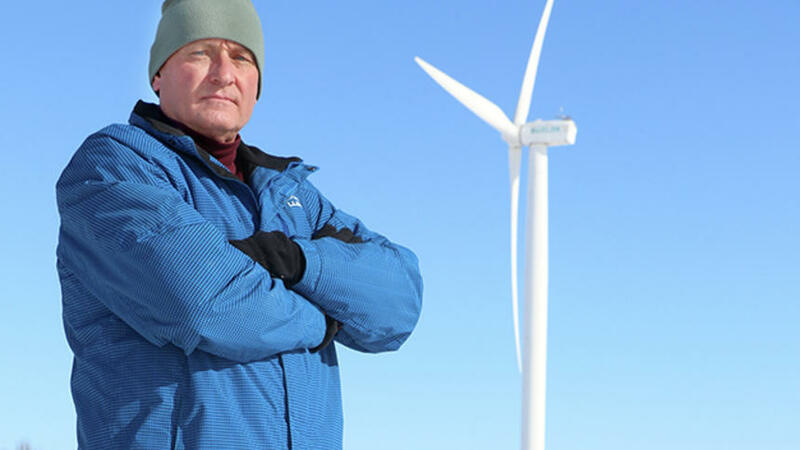 Behrends said he’s lost sleep over the turbines — the noise either wakes him or keeps him from falling asleep — and believes he’s a prisoner in his own home. “The commissioners, it’s almost like they don’t care about their residents — they need the tax money,” Behrends said. Sandager said he is all for the use of renewable energy, but he’ll stick with ethanol and biodiesel — and the antique windmill that efficiently pumps water on his farm. His beef with industrial wind is that he believes the federal tax credit offered for developing wind energy is a scam. He also believes the ones who will get hurt are the farmers — the landowners who sign contracts for wind turbines to be built on their property. Dennis Hartman, also of Hills, stands with Sandager in opposition to the RES plans for an industrial wind farm in his neighborhood. His home is within three miles of wind turbines — far enough away that he doesn’t hear them or get shadow flicker. He wants to keep it that way. RES installed a wind measurement tower last fall within a mile of Hartman’s acreage, and if it erects a turbine there, he’s convinced he will sell his home — likely for a lot less than what he could get if there wasn’t a turbine nearby, he said. “At first they didn’t believe that — they’d never heard of such a thing,” Connie said. But, after trying a new antenna and doing a study, Aspenall has now offered to pay the Janssens. Connie said the agreement is based not on the lifetime loss, but on just five years. Thanks for carrying this. Tom Behrends put together a public informational meeting last Saturday in Brewster, MN. Behrends invited US Congressman Jim Hagedorn, Minnesota Senators Bill Weber and Julie Rosen, and Minnesota Representatives Joe Schomacker and Rod Hamilton. Zero of five showed up. We had about 70 citizens attend. Great meeting with presenters from Minnesota, Iowa and South Dakota educating citizens and answering questions. ‘Can’t blame the commissioners’. You should. The other side of balanced budget isn’t always looking for increased revenues. It’s called cutting the pork. Too many Counties spend way too much for what the land can produce. People have to realize where the tax comes from, and plan accordingly. Not all can have a primary road in front of their house. AAA schools. It’s just the way it is. Speaking of which, my County seat just approved a 9M ‘addition’ to the school, and claims OUR taxes will ‘only’ go up ‘x’ amount because of the tower revenues. Gee. that’s nice. We didn’t need a new school in the first place. Nor another increase in RE tax. 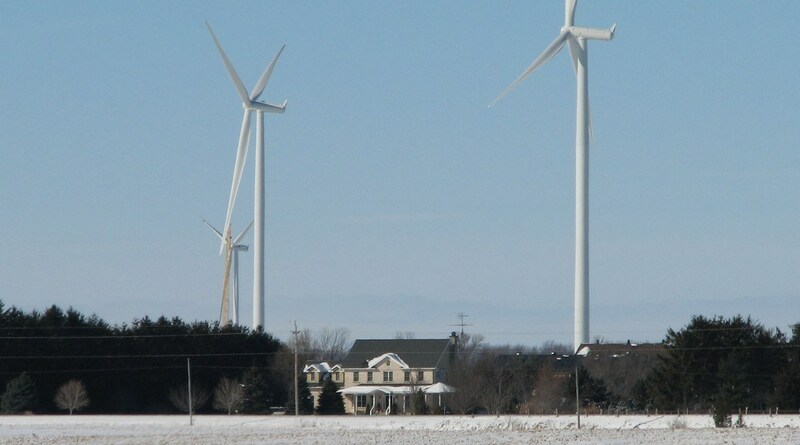 ………..in effect, the wind farm actually made life tougher in this County. 1. flying ice off the blades. I calve out my herd not 100 yards from a tower on the neighbors land. I have found sizable chunks of ice in amongst my baby calves. Who knows how large the ice was before it hit the ground and shattered. Calves are pretty tough, but not sure they could withstand a several hundred pound chunk to the head. Not to mention, if the damn thing goes down, it would easily land on my side of the fence. This county has no ‘set back rule’.. so make sure you know yours. 2. Lightning attraction. You have not seen a major strike until you’ve seen a tower getting drilled by lightning. It’s not just a ‘zap’.. and it’s done. It’s almost a 1-2 second massive discharge of the whole cloud. Who knows how far away from the tower my cows need to be to be ‘safe’. I sure don’t want to be around! 3. not proven, but not disregarded either: Electrical radio radiation. I make my living on how fertile my cattle are. They winter under, and in the shade of both the inter connect lines, and the towers themselves. Can anyone say for sure this radiation isn’t hurting my cow’s or bull’s reproductive tracts? I’m watching this like a hawk. 4. Speaking of hawks, I’ve found dead in past 2 yrs; 1 redtailed hawk, a mallard duck, and 2 pigeons. All within a couple hundred yards of the tower. The wildlife ‘watchdog’.. says the number of bats found under these towers would fill a dumptruck. I’ll have to take his word on it. 5. Last ‘polar vortex’ in January.. found most of the upper Midwest in 25 below zero temps. Towers are shut down because of the extreme cold, due to the blades becoming extremely inflexible, and prone to breaking. Guess what happened when N. Dakota, Northern Minnesota, and parts of Wisc. suddenly had to shut down this power??? They found out the natural gas generators didn’t have enough gas to make up the difference. Natural gas was the ‘go to’ for when the wind died. Not on this scale!!! Brown outs, and industry had to throttle back.. for several days until the temps warmed enough. Not cool. 6. ‘green’??? I saw unbelievable amount of diesel fuel burnt to build this ‘farm’. I wonder if the amount of GH gas released in the construction of this farm will ever be ‘made up’ in the generation of ‘clean electricity’ by wind.